A traditional Christmas gift combining Paxtons finest Stilton, Tawny Port & Cornish Buttermilk Biscuits. One of our most classic combinations presented in a traditional wooden box making it a perfect gift. 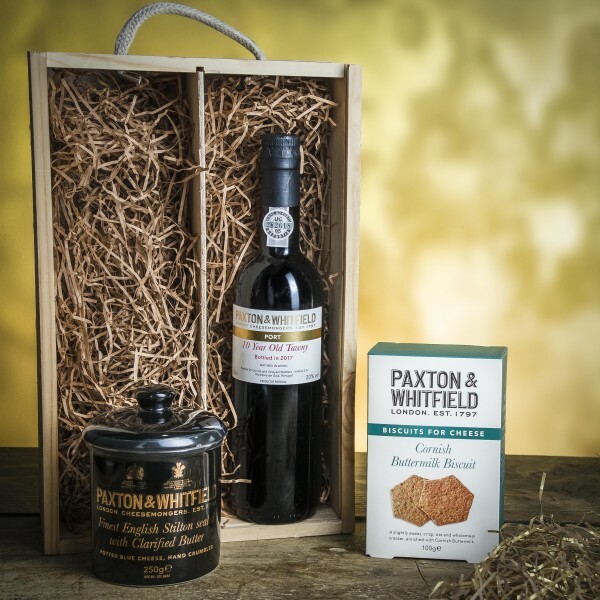 Paxton and Whitfield's 10 Year Old Tawny Port 50cl, mellow and elegant, combining delicate wood notes with rich aromas of mature fruit, a jar of our Finest Stilton PDO 250g (pasteurised, vegetarian) tangy, salty and terrifically creamy and our Cornish Buttermilk Biscuits 100g. This Tawny Port has been bottled for immediate drinking and does not need decanting. The flavour is mellow and elegant and combines delicate wood notes with rich aromas of mature fruit. Only available to customers aged 18 and over.